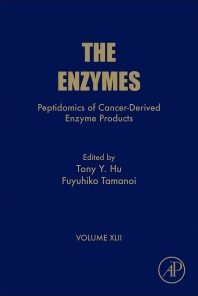 Peptidomics of Cancer-Derived Enzyme Products, Volume 42, the latest in The Enzymes series, is ideal for researchers in biochemistry, molecular and cell biology, pharmacology, and cancer, with this volume featuring high-caliber, thematic articles on the topic of peptidomics of cancer-derived enzyme products. Specific chapters cover Circulating peptidome and tumor-resident proteolysis, Colon tumor secretopeptidome, Chemoenzymatic method for glycomics, Human plasma peptidome for pancreatic cancer, Lipoproteomics and quantitative proteomics, Salivaomics: Protein markers/extracellular RNA/DNA in saliva, and Enzyme-responsive vectors for cancer therapy. Dr. Hu’s research focuses on developing and validating integrated nanotechnique-based strategies for marker discovery and molecular diagnostics in peripheral blood samples to provide a translatable solution for personalized medicine. His innovations aim to fill current gaps in early detection, real-time therapy monitoring and effective prognostics. He has assembled a diverse team with backgrounds in biochemistry, mass spectrometry, nanofabrication, and biomedical engineering to answer these needs. Dr. Hu received his Ph.D. in Biomedical Engineering from the University of Texas at Austin where he focused on developing nanomaterials as biosensors for disease diagnosis. He has published more than 50 journal articles and has received five U.S. patents (issued and pending) on these subjects since his first faculty appointment in 2011. Dr. Hu has also published four nanomedicine-related book chapters, and has given more than 40 seminars and invited presentations at major international scientific conferences. His research team has a history of grants from the NCI, NIAID, NICHD and DOD and awards from the Gates, Dunn, Kostas, and Cockrell family foundations. His team has in-depth knowledge of multiplex-detection method development for sample processing, mass spectrometry, biomarker identification and validation. This background ideally positions his team for a leadership role in these fields and for optimal clinical translation of their platforms for improved and comprehensive analysis of blood-based biomarkers that have broad potential clinical applications.